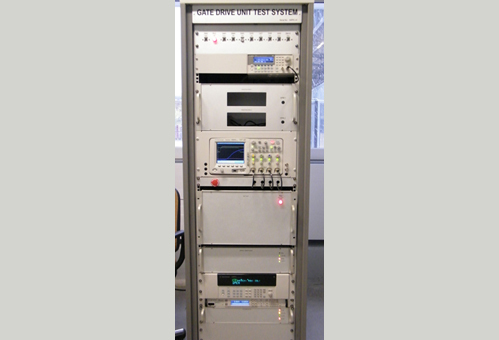 Gate Drive Unit Test System – Crest Test Systems Pvt. Ltd. This system is designed to evaluate the drive performance of different types of GDUs (Gate Drive Units) of Bombardier Transportation, such as C620, C625 and P150. The system has an arrangement to connect simulated loads to the output of the GDU, and a fibre optic transmitter and receiver for applying trigger pulses and reading the feedback signal from the optical port of the GDU. It consists of an extensive switch matrix and analog multiplexer for carrying out complex tests on the GDU under test.